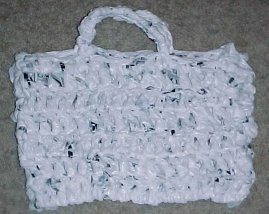 Can be used as a beach tote or a shopping bag. Stitches: ch, sc, dc, sl st.
Click here to watch a video about preparing "plarn". R1: With Q hook, ch20 loosely, dc in 4th ch from hook. Dc in ea rem ch. Rs2-12: Ch3, turn. Dc in ea dc. Fold Rs1&12 tog and crochet the sides tog by placing 2sc around the posts of the corresponding dcs. Turn inside out. Rejoin with a sl st, sc around entire edge. Join with a sl st. Using the center 7 sts on ea side. With Q hook, join with a sc in the first of the 7 sts. Ch10, sk 5sts, sc in the next st (this is the last of the 7sts). Change to P hook, sl st in same st, turn. 18sc around the 10chs, sl st in the first st you made when beginning the handle.